David (Guarrenzino) and I added a few retro-inspired conversions recently at JustForKl!cks. One of these is the figure I'm currently using as my avatar. Tim_w made some nice comments about it in my "Welcome" topic, so I thought he and the other PF members might like to see what the rest of "Peggy" looks like, if they haven't already visited the site. Though I do have to say she pales a little by comparison to "Jackie" (one of David's girls) who is also shown on this page. Pease click the pic above and it will take you to J4K where you can see more pics which can be opened at larger sizes. Wow !! they are excellent and very pretty !! I have allways been a big fan of both your's and Davids work, the attention to detail and presentation never fails to amaze me. I am really looking forward to seeing more of your work !! I second what Tim has allready said. Your painting skills are the most fantastic, so detailed. How do you do it? Attention to detail is right! Even the tiny paintings are authentic Tate replications (does "authentic replications" make any sense?) I love all 3 of your 60s ladies! Is Jackie the blonde? I still like that checkerboard dress the best! The dresses are perfect for the era. I'm not sure what method David uses, whether he masks areas off or just relies on neat brush lines. Usually I don't bother with masking because it slows me down, but I did try it when I was working on that dress. Serenity has started a topic in the "How-To" board about getting [sharp edges when painting], and I have posted my methods there. Hopefully those with better techniques than me will share their tips too. If you move your mouse over the pics, a description of each one (including the girls' names) will come up in small boxes. I did it this way because I didn't want to clutter the page with additional captions under the photos. Wow, way cool. I love Jackie's jacket and boots! I wouldnt be giving wet noodles for Jackie. She is just too cool. 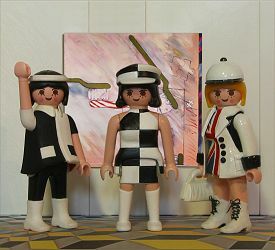 With that black and white theme in the clothes you've got the Mary Quant look to a tee.